While the responsibility for nurturing the next generation begins at home, the quality of our K-12 school system greatly impacts the flow and quality of talent in metro Milwaukee's economy. Milwaukee County’s K-12 landscape faces many challenges. Too many children are falling through the cracks, creating an uncertain future for our region's talent pipeline – your future workforce. Yet, Milwaukee boasts leaders in urban education who take the most challenged student populations and successfully prepare these students for the future. Check out the interactive map and click on the following sets of data for in-depth information about individual schools and the education landscape. Ranking are based on DPI state test data (Forward) for publicly funded students in Milwaukee County schools. 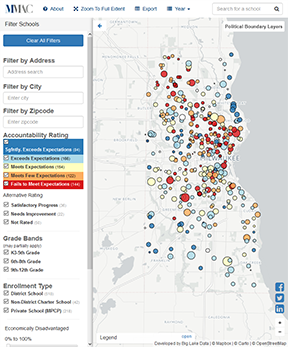 MMAC's Milwaukee School Quality Map provides an interactive tool for the community to identify and quantify success as well as areas in need of improvement in our region’s publicly funded schools.